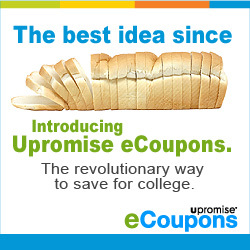 Upromise April eCoupons are up!. They have over $37 dollars in coupons this month. Load them now and have them saved for any purchases during the month! The money does not come off at the register but is put in your Upromise account. Yes! These are not tied to coupons or discounts in the store. Not a problem. We had a Upromise account for almost 2 years before our kids were born. Once we had kids we went in and changed it our of our names to our kids names. Grandparents can also sign up and have it go to their grandchildren! We have 3 sets of grandparents all saving a little bit for our kiddos. You can change the beneficiary at any time.